Amazon.com Price: $30.75 (as of 2019-04-25 14:06:12 GMT) Product prices and availability are accurate as of the date/time indicated and are subject to change. Any price and availability information displayed on Amazon.com at the time of purchase will apply to the purchase of this product. Inspired by the French kitchens, Cuisinart began making professional cookware over 30 years ago. Constructed of the finest materials available to perfectly perform all of the classic cooking techniques, Cuisinart continues its commitment to superior quality and innovation. 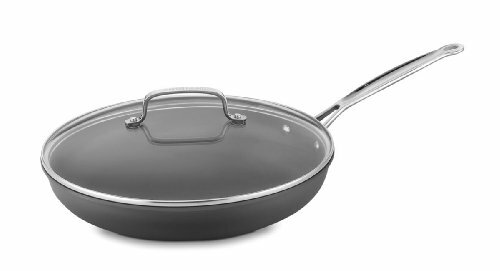 Cuisinart Chef’s Classic Non-Stick Hard Anodized skillets have sloped sides and wide flat bottoms for frying, sautéing, or browning. An extremely durable exterior with a smooth, hard anodized finish creates a look of professional elegance to complement any kitchen. Designed from the inside out for today’s healthy lifestyles, this collection is constructed with 100% aluminum-free Quantanium nonstick cooking surface reinforced with titanium. Features: Sloped Sides Deliver Perfect Performance|The sloped sides of the skillet maximize cooking surface. Skillets are designed for browning and tossing small pieces of food like mushrooms.|Hard Anodized Exterior|Cookware exterior is harder than stainless steel for durability and professional performance. Dense non-porous highly wear resistant.|Unsurpassed Heat Distribution|Hard anodized construction heats quickly and spreads heat evenly. Eliminates hot spots.|Quantanium Non-Stick for Professional Results|Quantanium nonstick cooking surface is reinforced with titanium for lasting food release healthy cooking and easy cleanup. Metal utensil safe.|Great for slowly cooking minced garlic in olive oil frying breaded pork chops or browning sausage.|Cool Grip Handle|Solid stainless steel riveted handle stays cool on the stovetop.|Drip-Free Pouring|Rim is tapered for drip-free pouring.|Constructed to Last|Lifetime warranty. Hot Cereal Deals at Amazon! Deal-a-Day Sites: A Good Place To Start!